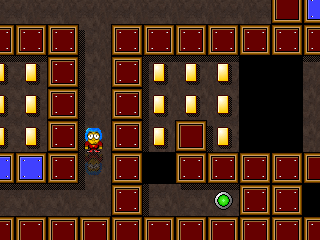 Sokoblast is a Sokoban-style game in which you navigate topdown mazes collecting treasures, triggering switches, and solving various puzzles that involve holes, bombs, boomerangs, and so on. I guess I should admit that I'm actually not familiar with the original Sokoban. But I've come to recognize the name when it's used, and I tend to like titles that are based on it. But regardless of whether you are familiar with this type of game, Sokoblast is another fun title by Hellbound. Presentation is pretty polished, with just enough graphical variety to keep things interesting. Things were occasionally a little visually confusing for me, but I didn't find that a major problem. The background music is nice and unobtrusive. Level design is the key in games like this, and I'm a little ambivalent about it in this game. The basic gameplay is fun, and elements of some levels are inspired, but a lot of the challenge is in simply doing things in the correct order. I would have liked a little more variety in the puzzles. That said, it is fun and challenging to look several moves ahead so you won't get stuck and have to start over. The game has built-in incentive to succeed, as although you have unlimited tries, the levels include a fair amount of backtracking that you don't want to have to repeat. There is also challenge (and sometimes frustration) in weaving your way through the mazes and trying not to accidentally fall in holes. At any rate, I think this game is worth a try, and I found it worth playing through to the end. Nobody has added Sokoblast as a favorite game yet. Be the first. I liked it. It was actually pretty fun. The graphics were nice, and the levels were designed well. Oh, I just played it again (a year later) just because it was a cool game. And now I realize that there was an available push-block to get there, I'm so stupid sometimes. Anyways, probably the best puzzle I've ever played. Ever. Nice work! Graphics were just great, the push-block-into-pit-that-leaves-a-graphic-that-the-character-walks-over engine was finished, it took me 6 months to figure out how to do that. The character wasn't really slow, I hate games that make the character go like, 1 pixel at a time. So yeah, this is getting my 10 now. I swear, level 14 is impossible. In order to get something I have to do something, but to do it I have to get the thing I want to get! Wow! WowowowowowowowowowWOW!!! Too much! This game was nearly perfectly done, but it's close enough, so here's a nice, tasty 10 for ya! Now, the graphics had but one flaw: Everything but the character looked to be categorized 'realistic'. The character, however, was 'cartoony'. Oh, small flaw. Next, the controls. Marvelously done, but you didn't mention some things in the tutorial (restarting, yellow blocks). But they become apparent throughout the game. Neext, the boomerangs. I detected 2 glitched with that. Well, one glitch and one error. The glitch being that you could throw a bommerang, step aside, and the boomerang would never afterward disappear. Then, I didn't see any opportunity to use it other than the tutorial. Hey, easily fixed, right? OK, with that done, everything else is you basic Sokoban with dynamite, keys, and switch blocks. The graphics? MARVELOUS! I looooove that reflecting effect! Love it! Gameplay? Enough to keep you hooked! Sound? Well, I don't like sounds, and these were hard to hear, fortune to me. Goodness has been realized within this game! PLAY IT!!! OR I WILL EAT YOU! !